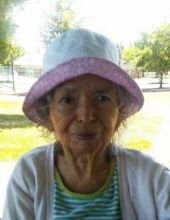 With family by her side, Catherine Torres passed away peacefully on April 1, 2019, at her home in Dundee, Oregon. Born July 11, 1926, in Brownsville, Texas, she was 92 years old. Catherine was raised by her maternal grandmother. She was married in 1943 to Candido Torres, and she raised seven children. Catherine's life was that of an itinerant farm worker, working primarily on the West Coast and then later settling in McMinnville, Oregon, alongside her husband as crops became mature and needed harvesting. She often did this work with her children in tow who worked the fields alongside her. She instilled a strong work ethic and positive life attitude in each of them. Preceding her in death were her husband, Candido; daughter, Gracie Torres; and son, Candido Jr. Survivors include Linda Moreno, Berta McKaig, Vieto Torres, Fay Schroepfer and Joanne Medina; 21 grandchildren; and numerous great-grandchildren. To send flowers or a remembrance gift to the family of Catherine Vasquez Torres, please visit our Tribute Store. "Email Address" would like to share the life celebration of Catherine Vasquez Torres. Click on the "link" to go to share a favorite memory or leave a condolence message for the family.